William Hage provides a full range of keyhole operations on the knee. This technique has lower complication rates and patients recover more quickly with very small scars. In most cases arthroscopy (keyhole surgery) leads to diagnosis and treatment of knee problems in one operation. Patients are commonly discharged the same day and are able to walk on the leg immediately. Patients with pain in the knee after a specific accident or injury can be seen quickly and the problem identified in days rather than months. This includes the use of early MRI scans when necessary. 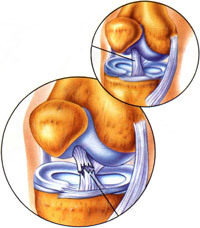 Ligament tears such as the ACL (anterior cruciate ligament) are reconstructed by Mr Hage promptly using techniques perfected at international level. Mr Hage sees and treats patients for kneecap dislocations, cartilage regeneration procedures, multiligament injuries and revision ligament reconstruction where a previous attempt at surgery has failed.